There are currently 88,567 users on this website. Just based on the photos alone, what can be said about what is right or wrong about this coin? As I said earlier, I'm weak on understanding what I see. To my eyes it looks like a good coin. Which is why I hesitate to comment on other posted 8 Reales images from other members. Weight, measures & edge pics can follow, but for now, how do you guys evaluate this coin? If illumination is an issue, I can provide others pics with different lighting & contrast. I can also provide a close-up image of any particular detail you may want to see on either side if requested. If you're just starting with the look of the coin, what have you done to compare it with likely authentic examples? That's where I start. 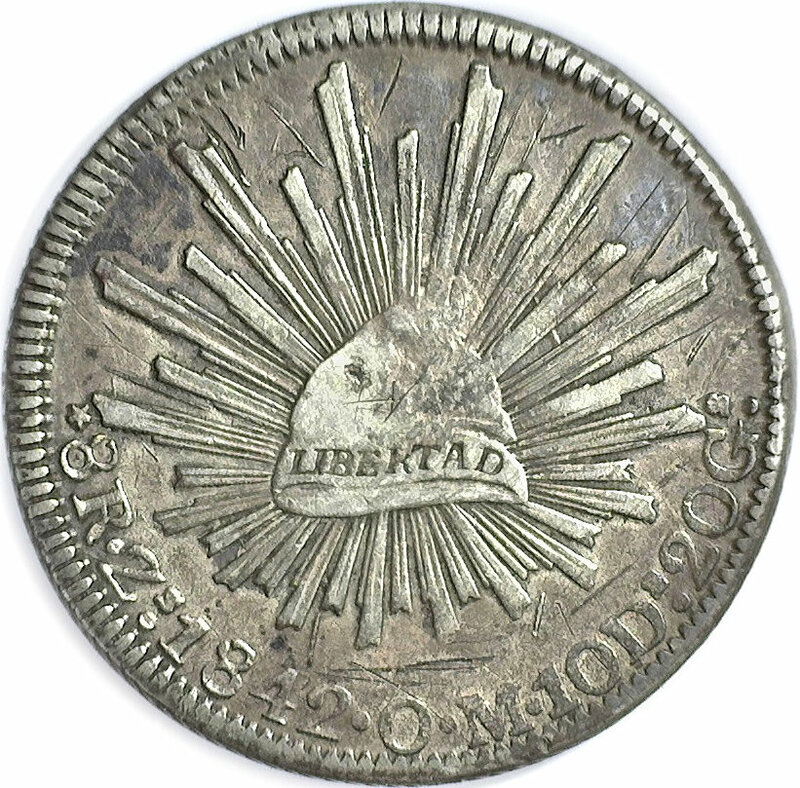 Now, I don't feel like pulling up images from Heritage right now so I will just start by saying the dentils look appropriate -- that's one of the features that is consistent across the older 8 reales that I collect and these issues that I don't collect. Albert The 1842 Zs OM you have posted is a Contemporary Circulating Counterfeit. It is part of a large family of related dies which I have identified by variuous mules that I have examined. The group that made these dies were very professional and some of the dies are known to have been made before 1845 because coins made with some of those counterfeit dies appear in Riddell's "Monograph of the Silver Dollar, Good and Bad. The eagle that I use as my avatar on this forum is from an 1842 Zs OM example that uses the same "Chicken Eagle" design found on the Riddell # 237. 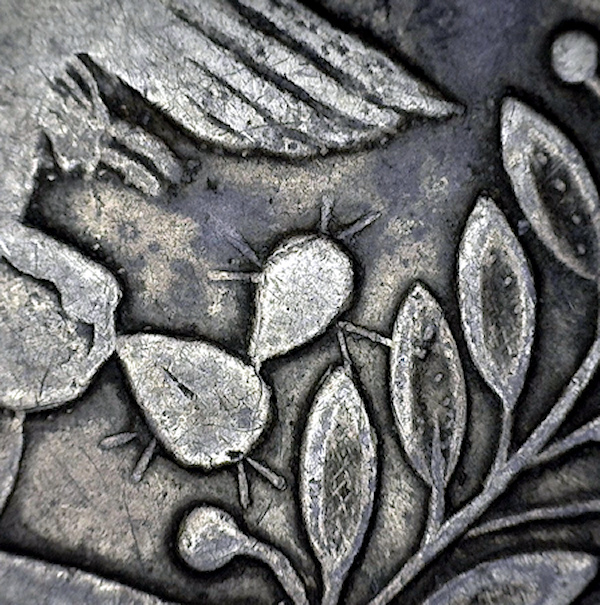 The design of the coin that starts this thread is an example of the "Pierced Leaf Eagle die". In this case one of the cactus spines from the cactus pad furthest to the right pierces a laurel leaf in the wreath. The tip of the cactus spine appears near the center vein of the Laurel leaf. Here is a picture of the Pierced Leaf. 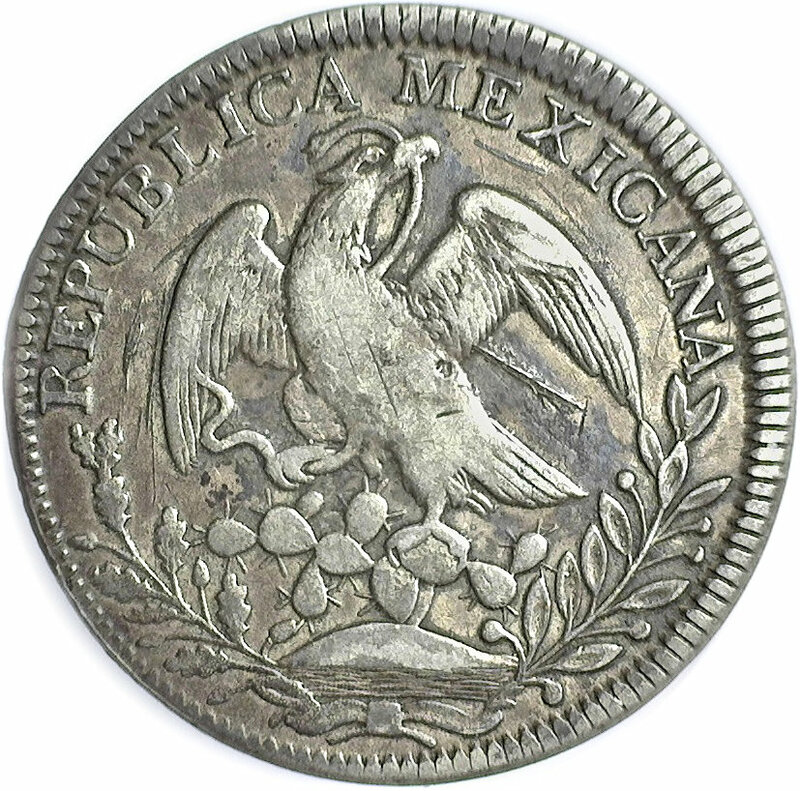 If you compare this counterfeit with a genuine Mexican 1842 Zs OM you will find there are few matches. 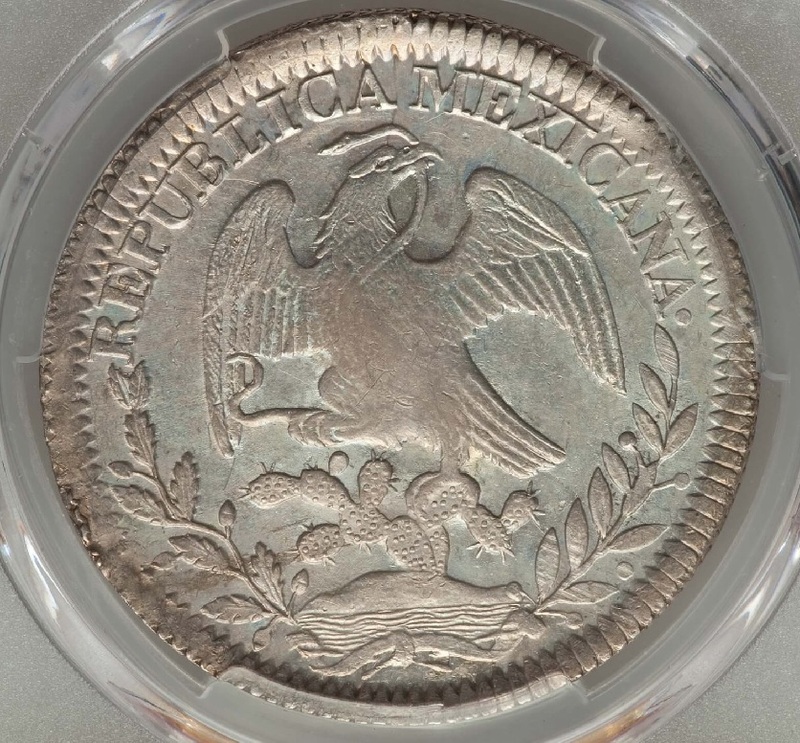 The problem is there are two different eagles used on genuine 8Rs at Zacatecas that year so you need to know the difference. I have to leave right now. But one detail to compare is the shape of the tail (which is also the diagnostic for the two genuine types). 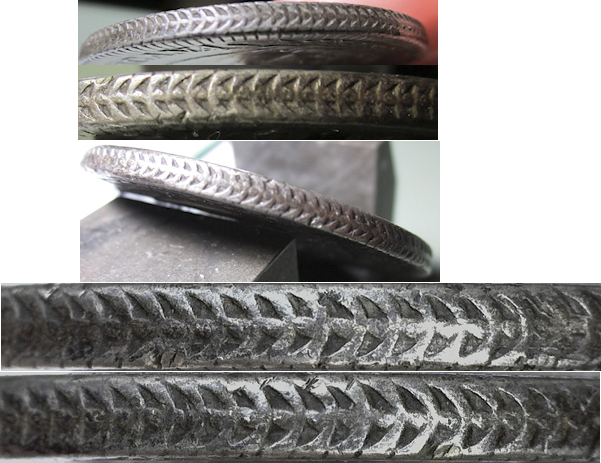 Here is a comparison with an NGC graded example of the Square Tail variety (MS 62). I will be back later this evening and can add as many details as anyone could need to clearly see the difference. Just to let everyone know diagnosing this counterfeit took all of 5 seconds top. Typing up this post took 10 minutes. Maybe Albert can clarify what his goal was with this post. Perhaps he was looking for tips that could get him to the point where "diagnosing this counterfeit took all of 5 seconds top." Or maybe he was looking for a analytic framework that would allow him to step through the process for identifying key features to look for this type of 8 reales. Have you read swamperbob's book, Albert? Edit to add: Nice pickup -- I imagine it might be more valuable as a contemporary counterfeit. Cactus on the eagle side look all wrong to me. But I am not an expert on these Cap and Ray coins. Here is the cactus needle, wreath and bird tail. These are the kinds of things I need to learn about so they can be described in the dialog box when I make the coin pages going into the binder. I don't have the book, are these things well described in that book, I'll have to make a point of getting it if so. What other books are also most useful? I'm not familiar with Riddell, but perhaps that is another to have? I have a lot of Asian coin reference books, but about none for 8 Reales. What is your goal? In my opinion you need decades of experience to do what swamperbob does in 5 seconds. Do you aspire to that level of competence in spotting counterfeits in this vast and greatly varied series? If you are a contemporary counterfeit type collector -- and there's nothing wrong with that -- then you just got your example and can move on to other types. If someone like Albert wants a quick method of proving a coin like this is a counterfeit - the only easy way is Specific Gravity. 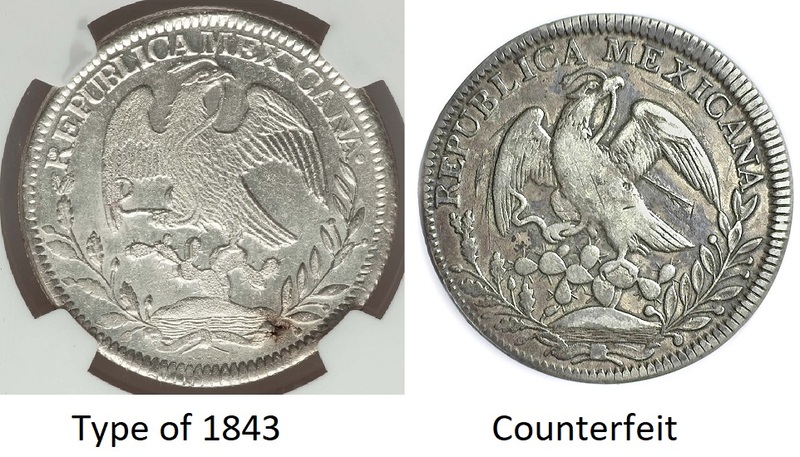 That will take more than 5 seconds perhaps more than 10 minutes, but that was the method most mints, banks and large merchants identified counterfeit coins in 1835. That is how the US, UK and French mints checked authenticity of both silver and gold coins. In 1835 the UK officials in China taught the Schroffs (Chinese money authenticators) how to do specific gravity tests so that locally made counterfeits were not presented to UK merchants for payment of Opium sales. To get to a point where you can look at a coin and know instantly - you will need to memorize what genuine 8Rs looked like by year and mint. I am confident that I can do that. Developing this expertise became far easier in 1999 when Mike Dunnigan published Resplandores. To catch up to where I am - you need to not only own that book but use it and test yourself OVER and OVER again. You need to look at that book until the pages shake loose and the covers have to be reattached with duct tape. When I posted earlier I picked the Type 2 (eagle of 1843 type) very intentionally. It was a test. Cactus on the eagle side look all wrong to me. 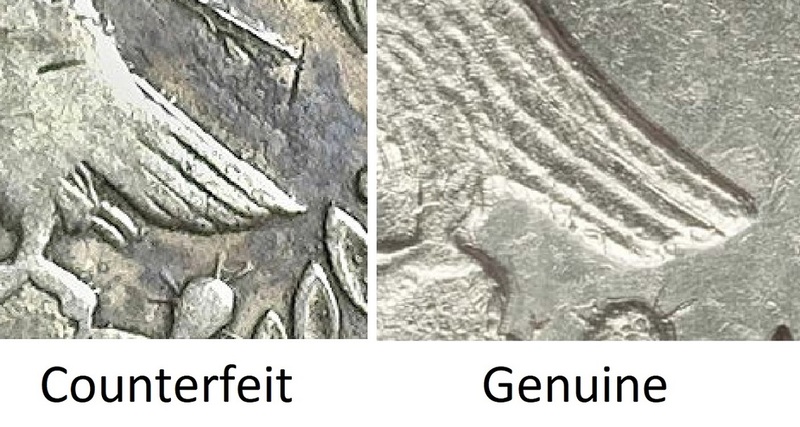 The counterfeiter who cut the eagle die in the subject coin used the TYPE 1 as his model and not the TYPE 2. 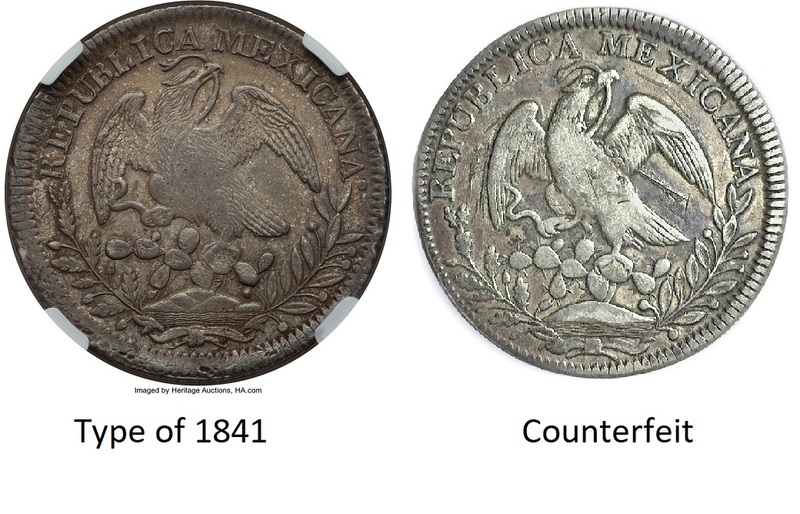 When you compare the TYPE 1 (eagle of 1841) with the counterfeit the differences are fewer. Here is the reverse die used on the rare 1842 Zs OM Type of 1841. Here is the reverse die used on the very common 1842 Zs OM Type of 1843. This is the "missing Pad variety of the 1842-1843 a sub-variety not listed in Resplandores. It is very common. Here is the reverse die used on the type of 1843 with the pad. These are facts you need to know to do what I do when I identify coins in this series. The Cap and Ray coins of the First Republic (ending 1862) is my favorite coin series and has been since 1960 when I bought my very first Cap and Ray 8R. Back in those days I started taking 35 mm pictures of the C&R eagles in an attempt to do what Mike Dunnigan accomplished in 1999. 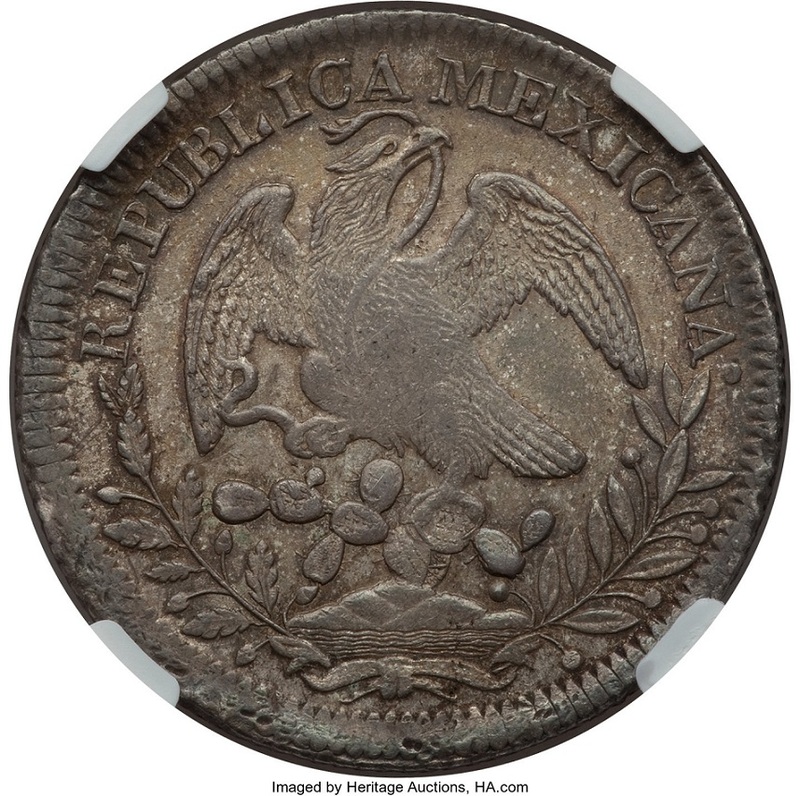 When I began to fight with dealers who believed there were THREE genuine eagle varieties in 1842 at Zacatecas I was 14 years old. I knew that the Riddell # 237 existed and the "Chicken Eagle" (my name for this skinny bird) was counterfeit, but these older long term dealers were just as positive that I was wrong. Today there is no excuse not to own Mike's book if you want to collect Cap and Ray 8Rs. This is not an add for Mike's book although it could be. It is simply a fact that any serious collector needs to know what the genuine coins looked like. So start by learning the series one mint at a time. You need to be at a point where you need only to look at the eagle to identify the mint. I began with the Zacatecas mint for two reasons - my childish reason was that I liked the mint mark Zs, but I had a second more adult reason. 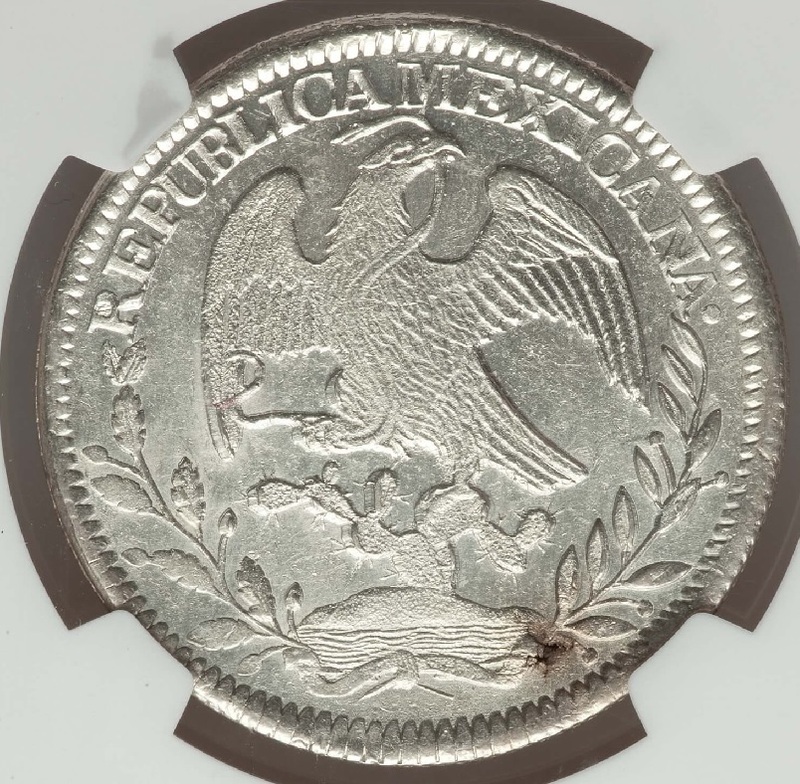 I knew that Zacatecas was the most often counterfeited mint of all the 14 Mexican mints according to Riddell and my primary interest was in finding counterfeits. I first had access to Riddell's book in 1960 a dealer friend owned a copy but did not own a copy of my own until I could afford one of the reprints that were issued in 1969. More to follow after those interested have had a chance to compare the 1841 versus 1843 styles and to see clearly that the attempt by the counterfeiter used a type of 1841 eagle. 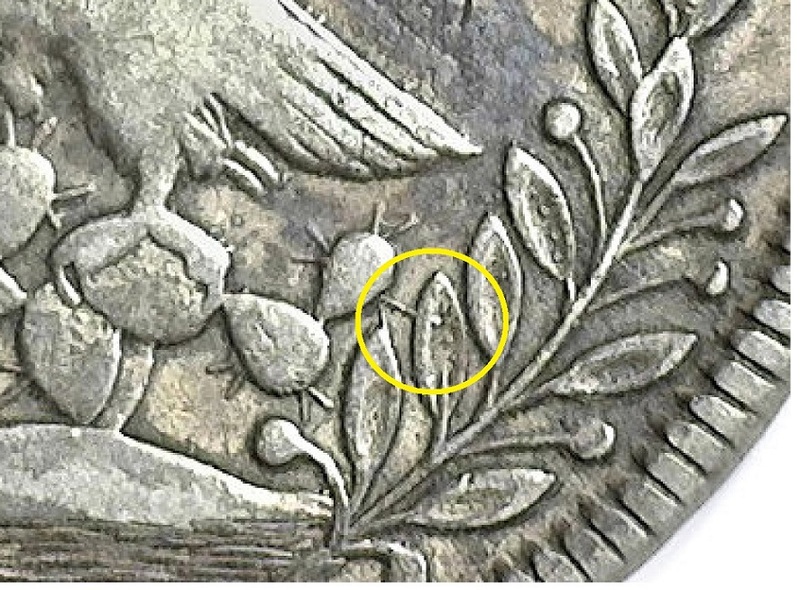 So then the cactus needle poking through the leaf and the bird tail are really all that needs to known for this coin as far as visible diagnostics? Anything of note on the other side? My "goal" is to know enough about what is wrong with the various coins so that I can describe it as a diagnostic or point of interest. Same as I do for Chinese coins. I just don't know as much as I want to on 8 Reales coins. So I don't know what to print in the dialog box when I create the printed pages. And I have a small number of them. Thanks to swamperbob, I now at least know some things of importance that I can use for this coin. To save those interested some time, here are the two comparisons I proposed above. It should be very obvious that the counterfeiter used the Type 1. Albert there are many more differences than the two I remarked about. All you need to see are these two but what if you see a coin with two chops in the wrong places. Stay tuned for more points of variation. I try to scale each detail area to similar sizes. To my eyes the first two (counterfeit followed by 1842 Zs OM Type of 1841) are closer matches than the second two (common 1842 Zs OM Type of 1843 followed by type of 1843 with the pad). Ok so you got some key info on the 1842 Zs OM 8 reales. What's next? What's next are some edge photos taken at various directions and angles. To answer swamperbob SG= 8.67 for this piece. 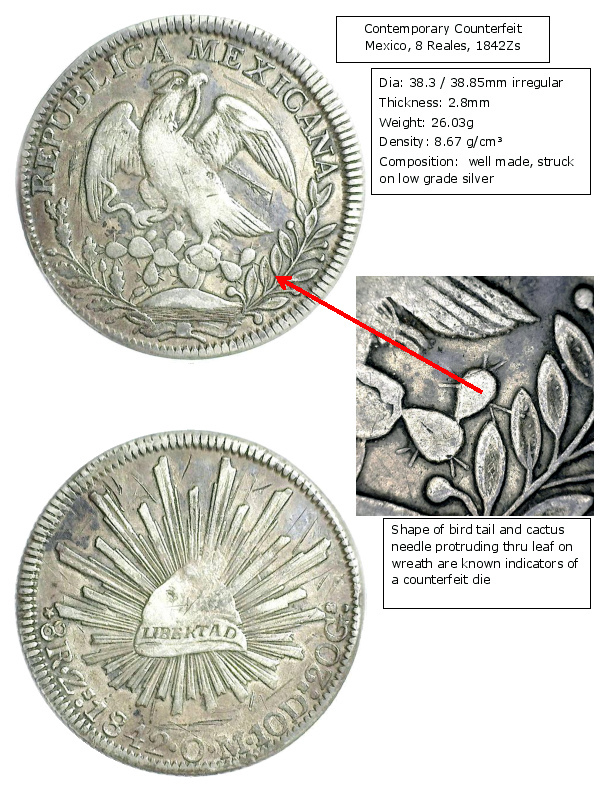 Measurements are items I print when the coin page is made, and now with your help, I can also add the explanation regarding the bird tail, cactus needle & wreath. That way the reader is better informed about the photos when things that are wrong with the coin are pointed out. Any comments about the edge pictures? I am ready to buy the un-real reales book but have one question. I find hardcover at one price and paperback at a lower price. Is there any difference regarding the images comparing the hardcover book compared to the paper back? As it is now, unless more comments can be added to the topic coin, here is the page intended to go into the binder along with the coin. My goal or motivation for these posts is simply this: I was motivated by coming across a booklet titled Counterfeit Detection, reprinted from The Numismatist. It consists of numerous photos of counterfeit coins along with close-ups of key points of interest as well as a brief explanation. I decided to catalog my collection in a similar manner. But in this case of 8Reales, I lacked the expertise to know what to print so the reader would better understand why & how the featured coin is a fake. Not my area of collecting, but I wanted to interject that this thread has been extremely interesting to me. Thx!